State Route 91 (SR 91) is a major east–west freeway located entirely within Southern California and serving several regions of the Greater Los Angeles metropolitan area. Specifically, it currently runs from Vermont Avenue in Gardena, just west of the junction with the Harbor Freeway (Interstate 110), east to Riverside at the junction with the Pomona (State Route 60 west of SR 91), and Moreno Valley (SR 60 and I-215 east of SR 91) freeways. The route is part of the California Freeway and Expressway System. SR 91 is part of the State Scenic Highway System from SR 55 to the east city limit of Anaheim, in the western part of the Santa Ana Canyon, and is eligible for the system through the canyon to Interstate 15. SR 91 inherited its route number from the mostly decommissioned US 91, which passed through the Inland Empire in a northeasterly direction on its way to Las Vegas, Salt Lake City, and points beyond. Those segments of US 91 are now parallel to, or have been replaced altogether by, I-15. SR 91 officially used to head west all the way to the Pacific Coast Highway (State Route 1) in Hermosa Beach, but this segment was relinquished to local governments in 2003, and is no longer part of a state highway. From the Harbor Freeway to its intersection with the Long Beach Freeway in northern Long Beach, SR 91 is named the Gardena Freeway. Between the Long Beach Freeway and its intersection with the Santa Ana Freeway at the Fullerton-Anaheim border, it is named the Artesia Freeway. From the Santa Ana Freeway to its eastern terminus at the intersection of the Pomona, Moreno Valley, and Escondido Freeways, it is named the Riverside Freeway. The Gardena Freeway is a short freeway in southern Los Angeles County. It is the westernmost freeway portion of State Route 91. It begins just west of the Harbor Freeway at the intersection with Vermont Avenue in the eastern edge of the city of Gardena, proceeding eastward approximately six miles (10 km) until it intersects the Long Beach Freeway. Thereafter, SR 91 is known as the Artesia Freeway. Until 1991, the Gardena Freeway was known as the Redondo Beach Freeway. The name change reflected the successful efforts of the cities of Torrance and Redondo Beach to block the extension of the freeway westward to its intended terminus at the cancelled Pacific Coast Freeway in Redondo Beach. In 1997, the California government dedicated the portion of 91 between Alameda Rd and Central Ave to former assemblyman Willard H. Murray Jr. The Artesia Freeway is a freeway in southeastern Los Angeles County and northwestern Orange County. It is signed as State Route 91 for its entire length. It runs east–west from its western terminus at the Long Beach Freeway in northern Long Beach to its eastern terminus at the Santa Ana Freeway at the Fullerton-Anaheim border. (SR 91 continues west of the Long Beach Freeway as the Gardena Freeway, and east of the Santa Ana Freeway as the Riverside Freeway.) The "Artesia Freeway" name originally was assigned to the entire length of SR 91 west of the Santa Ana Freeway in the early 1970s since it was, in sense, the freeway realignment of SR 91 from the paralleling Artesia Boulevard. The 91 Express Lanes is a ten-mile (16 km) high-occupancy toll road / full tollway combination contained entirely within the median of the Riverside Freeway (State Route 91) in Orange County, California. They run from the Costa Mesa Freeway (State Route 55) interchange in Anaheim to the Riverside County line. The 91 Express Lanes consist of two primary lanes in each direction, separated from the regular, main lanes of the Riverside Freeway with reflective yellow, 3' high, plastic lane markers (as opposed to concrete barriers or a similar "solid" barrier). Each direction also has an additional high-occupancy vehicle lane, called the "3+ Carpool Lane", that can only be used by motorcycles, zero emission vehicles, and vehicles with three or more passengers that is equipped with a FasTrak transponder that is assigned to valid prepaid toll account. Access to the 91 Express Lanes are provided only at its east and west ends. All tolls are collected using an open road tolling system, with each vehicle required to carry a FasTrak transponder; there are no toll booths to receive cash. The 91 Express Lanes use a variable pricing system based on the time of day. The road is not truly "congestion priced" because toll rates come from a preset schedule instead of being based on actual congestion. Since July 1, 2011 the toll on the busiest hour on the tollway, 3:00 pm to 4:00 pm eastbound on Fridays, is $9.75, or approximately $0.97 per mile, the highest toll for any toll road in the country. The highest toll in the morning rush hour, 7:00 am to 8:00 am westbound Monday to Thursday, is $4.60. Motorcycles and vehicles with three or more passengers who use the "3+" carpool lanes are not charged a toll, except when traveling eastbound from 4:00 pm to 6:00 pm on weekdays. During that period, they are charged 50% of the full posted toll. Even though there may be no toll charge, a FasTrak transponder is still required on all vehicles using the "3+" carpool lanes. A Toll Policy is published which states the criteria where tolls will be raised. The policy is designed to "a) reduce the likelihood of congestion by diverting traffic to other hours with available capacity; b) maintain free flow travel speed in the 91 Express Lanes; c) maintain travel time savings; d) accommodate projected growth in travel demand and; e) ensure that the toll road generates sufficient revenue to effectively operate the toll lanes and maintain a strong debt service position." Changes to the toll schedule require ten days notification to the public and the OCTA board. Once tolls are changed during the "super peak" period, they may not be changed again for six months. All tolls increase annually due to inflation. Despite this, the toll lanes are generally free flowing during most peak hour conditions. Before the present freeway was constructed, SR 14 ran along Gould Avenue, Redondo Beach Boulevard, Compton Boulevard, Alameda Street, Artesia Avenue, La Habra Road, Firestone Boulevard and Orangethorpe Avenue. In the 1964 renumbering, SR 14 was renumbered to SR 91. Also, before 1997, SR 91 continued all the way to State Route 1 in Hermosa Beach. At that time, the route became discontinuous in Gardena, the portion between Vermont Avenue and Western Avenue being turned over to the city. In 2003, the western portion, from SR 1 to Western Ave. was relinquished to the local jurisdictions. The first segment of the freeway was made in 1965 signed as US 91, and the last segment was made in 1975. However, Artesia Blvd. from I-405 to SR 1 is still marked as SR 91 to this day. Due to rapid population growth and the decline in the availability of affordable housing closer to job centers in Orange County, new residential development began in earnest in western Riverside County (consistent with similar accelerated growth throughout the Inland Empire) from the 1980s through today. This new development is occurring in or around existing cities such as Riverside, Corona, Norco, Moreno Valley, Lake Elsinore, and Temecula. This new development has also created new incorporated cities such as Menifee, Eastvale, and Jurupa Valley. As there are very few direct routes between Orange and Riverside Counties because of the Santa Ana Mountains that separate the two counties, the Riverside Freeway is subject to a very heavy traffic volume, composed primarily of commuters traveling between where they work in Orange County and where they live in Riverside County (often referred to by traffic reporters as "The Corona Crawl") Typical peak period delays were 30–40 minutes in each direction in the ten miles (16 km) of the tollway before construction. Solutions to the traffic problem were limited. The chosen solution was to create a toll road in the median of the freeway. The toll road route operates between the Orange/Riverside county line and the Costa Mesa Freeway (SR 55) interchange in eastern Anaheim, a distance of about 10 miles (16 km). The project was developed in partnership with the California Department of Transportation (Caltrans) by California Private Transportation Company (CPTC), which formally transferred ownership of the facility to the State of California prior to opening the project to traffic on December 27, 1995. Caltrans then leased the toll road back to CPTC for a 35-year operating period. The new lanes have been officially designated a part of the state highway system. The California Highway Patrol (CHP) is responsible for providing police services at CPTC's expense. Maintenance and operational costs for the facility are also the responsibility of CPTC. Opening in 1995, the 91 Express Lanes is the first privately funded tollway built in the United States since the 1940s, and the first fully automated tollway in the world. The express lanes have been controversial because of a "non-compete" agreement that the state made with CPTC. The clause, which was negotiated by Caltrans and never was brought to the legislature, prevent any improvements along 30 miles (48 km) of the Riverside Freeway to ensure profit for the express lanes. This includes restricting the state from widening the free lanes or building mass transit near the freeway. CPTC filed a lawsuit against Caltrans over freeway widening related to the interchange with the Eastern Transportation Corridor interchange, which was dismissed once the purchase with OCTA was finalized. Following the settlement, an additional lane was added for a 5 mile segment eastbound from SR-241 to SR-71, which has decreased usage of the toll road and revenues. However, as a result of the controversy, more toll road advocates favor creating local agencies similar to Transportation Corridor Agencies to build and maintain future tollways. New toll roads would be financed with tax-exempt bonds on a stand-alone basis—taxpayers would not be responsible for repaying any debt if toll revenues fall short. Also, there would be a less restrictive "non-compete" clause: they would be compensated only for any revenue loss caused by improvements near the toll roads. Riverside County officials also plan to extend the 91 Express Lanes east from the Orange-Riverside county line to Corona; scheduled completion date for this project is 2017. Once completed, both Orange and Riverside County transportation agencies will co-manage the 91 Express Lanes. ^ California Department of Transportation. "Route 91". Scenic Highways. California Department of Transportation. Retrieved February 2008. ^ Los Angeles Olympic Organizing Committee (1985). Official Report of the Games of the XXIIIrd Olympiad Los Angeles, 1984 (PDF). vol. 1, part 1. Los Angeles Olympic Organizing Committee. pp. 113–6. ^ a b 91 Express Lanes. "Most Frequently Asked Questions". 91 Express Lanes (Orange County Transportation Authority). Retrieved August 29, 2011. ^ a b 91 Express Lanes. "Toll Schedules". 91 Express Lanes (Orange County Transportation Authority). Retrieved October 13, 2009. ^ Weiss, Eric M. (March 3, 2007). "Steep Prices Projected for HOT Lanes". The Washington Post. Retrieved April 23, 2010. ^ 91 Express Lanes (July 14, 2003). "Toll Policy". 91 Express Lanes (Orange County Transportation Authority). Retrieved August 29, 2011. ^ "Brice Canyon, Zion Canyon National Park, Utah". ^ Nystrom, Eric Charles (March 2003). "From Neglected Space to Protected Place: An Administrative History of Mojave National Preserve". ^ "United States Numbered Highways". ^ "For Sale". Long Beach Independent. June 5, 1949. Stucco construction. 4 year old. On Highway 18 and 91. ^ a b H.M. Gousha Company (1955). Enlarged Map of the Los Angeles District (Map). H.M. Gousha Company. Archived from the original on July 26, 2011. ^ National Bridge Inventory database, 2006: the bridge over Compton Creek and Alameda Street is dated 1956. ^ California State Assembly. "An act to amend sections 2, 3 and 5 and to add two sections to be numbered 6 and 7 to an act entitled 'An act to provide for the acquisition of rights of way for and the construction, maintenance...". Fiftieth Session of the Legislature. Statutes of California. State of California. Ch. 767 p. 2040. "State Highway Route 60 near Hermosa Beach to State Highway Route 43 in Santa Ana Canyon via Artesia Avenue." "Cerritos Avenue to State Highway Route 43 near Olive via Anaheim." ^ California State Assembly. "An act to establish a Streets and Highways Code, thereby consolidating and revising the law relating to public ways and all appurtenances thereto, and to repeal certain acts and parts of acts specified herein". Fifty-first Session of the Legislature. Statutes of California. State of California. Ch. 29 p. 277, 278, 286. "Route 31 is from: (a) San Bernardino to the Nevada State line near Calada, via Barstow. (b) Route 26 near Colton to Route 9 near San Bernardino via Mt. Vernon Avenue." "Route 43 is from Newport Beach to Route 31 at Victorville, via Santa Ana Canyon, San Bernardino, Waterman Canyon, "Crest Drive" into Bear Valley, Big Bear Lake and Baldwin Lake. Route 43 includes a highway around Big Bear Lake." "Route 175 is from Route 60 near Hermosa Beach to Route 43 in Santa Ana Canyon via Artesia Avenue." "Route 178 is from Cerritos Avenue to Route 43 near Olive via Anaheim." ^ Rand McNally & Company (1933). Los Angeles & Vicinity (Map). Chicago: Rand McNally & Company. ^ H.M. Gousha Company (1953). Long Beach (Map). H.M. Gousha Company. Archived from the original on October 27, 2009. ^ Map of Los Angeles and Vicinity (Map). 1939. ^ "Evaluating the Impacts of the SR 91 Variable-Toll Express Lane Facility Final Report" (PDF). May 1998. Archived from the original (PDF) on November 26, 2006. ^ Price, Willard T. (April 2001). "An Odyssey of Privatizing Highways: The Evolving Case of SR 91". Public Works Management & Policy 5 (4): 259. Retrieved September 24, 2011. ^ Orange County Transportation Authority & Riverside County Transportation Commission. "Irvine-Corona Expressway". Orange County Transportation Authority. Retrieved October 9, 2014. ^ a b c d "SR 91 Project". Riverside County Transportation Commission. Retrieved July 5, 2015. ^ California Department of Transportation (July 2007). "Log of Bridges on State Highways". California Department of Transportation. ^ California Department of Transportation (2006). "All Traffic Volumes on CSHS". California Department of Transportation. ^ Kals, Sunny (June 28, 2007). 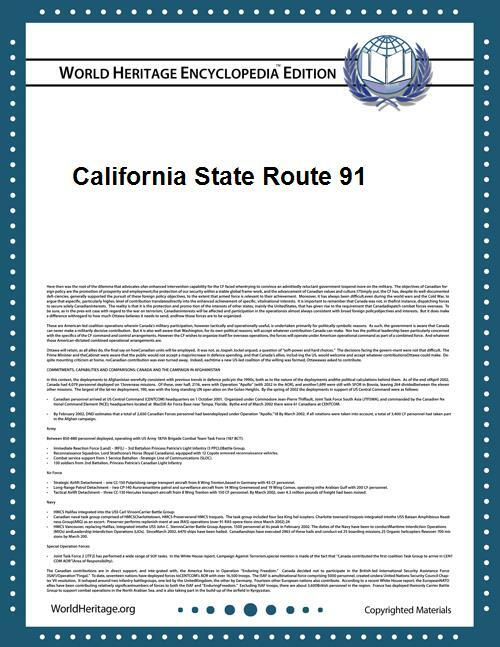 "SR 91 Eastbound" (PDF). ^ Wilson, Janet (April 19, 2004). 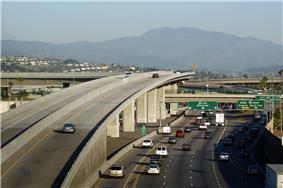 "Wildlife Highway Under Busy 91 Freeway Links Vital Habitats". Los Angeles Times.